Keeping Marijuana Moment online and updated with the most important breaking news takes considerable resources, and we can’t do this work without your help. While we generate some revenue from advertising, Marijuana Moment’s most stable base of support is the growing number of readers who value our cannabis advocacy journalism enough to chip in with a monthly pledge on Patreon. At varying pledge levels, Marijuana Moment supporters get access to rewards like cannabis legislation tracking tools, shoutouts and early and exclusive content. 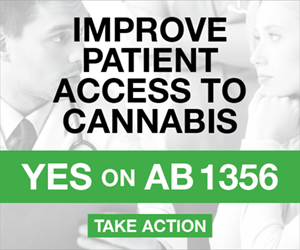 If you value staying up to date on marijuana news, please help us keep doing this. 3C Consulting, 4Front, Akerman LLP, David Alport, American Vaping Association, Americann, Americans for Safe Access, Arcview Group, BioTrackTHC, Cara Boucher, Briteside, Alan Brochstein, Hal Broker, Canna Advisors, Cannabis Mark Professionals LLC, Cannabis Saves The World DC420LA, Kaliko Castille, CB1 Capital Management, CBDforShopify.com, CBDPure CBD Oil, Tauhid Chappell, Citizens Opposing Prohibition, Danny Clancy, Colorado Harvest Company, Michael Correa, Michael Cosgrove, Sebastien Cotte, Sam D’Arcangelo, Theresa Daniello, Denver Relief Consulting, Sean Donahoe, Drug Policy Alliance, Sarah Duff, Robin Ely, Nico Enea, Sue Evans, Zack and Jackie Evans, Steve Fox, Frantz Ward LLP, Dawn Gochnour, Adam Gordon, Patrick Gorman, Green Bits, Green Thumb Industries, Green Wise Consulting, GreenMarket Bank, Greenspoon Marder LLP, Jeffrey Griffiths, Chloe Grossman, Hager Law LLC, Tim Hitt, Honest Herb, Angela Janis, Pete Kadens, Kannatopia, Khurshid Khoja, Stephanie Kiel, Kusheo, Law Offices of Joseph A. Bondy, Leafly News, Leafwire, Jessica Lee, Neal Levine, The Liaison Group, Jeff Livingston, Erin Lumley, M. Allen Hopper Law and Cannabis Consulting, Marijuana Industry Group, Marijuana Policy Project, Marijuana Surveys, MarijuanaMarket.com, Marino PR, Sean Markey, Max Mausner, Randal Meyer, Missouri Medical Cannabis Trade Association, MOFARMA21, N2 Packaging, New England Cannabis Network, NisonCo Cannabis PR, Al Olson, Ben Pollara, Alex Popoff, Prohibition Partners, Robbins Group LLC, John Robinson, Rose Law Group, Leise Rosman, Scott Rudder, Adam Scavone, SEELZ-IT Security Seals, Jeff Siegel, Charles Smith, SPARC, Splimm, Eric Sterling, Justin Strekal, SuperDoobie.com, Takoma Wellness Center, Temescal Wellness, Terra Tech Corp., Adam Terry, Eapen Thampy, Shaleen Title, Jeremy Unruh, Veterans Cannabis Coalition, Veterans Cannabis Project, Viridian Staffing, Weedmaps and Mona Zhang.